Much of the time you plan to do something fun with the kids and it comes off differently than you had anticipated; the kids don't take naps and become grumpy, the weather doesn't cooperate, you forget the camera, something. But every now and then you plan something fun to do with the kids and it comes off perfectly. 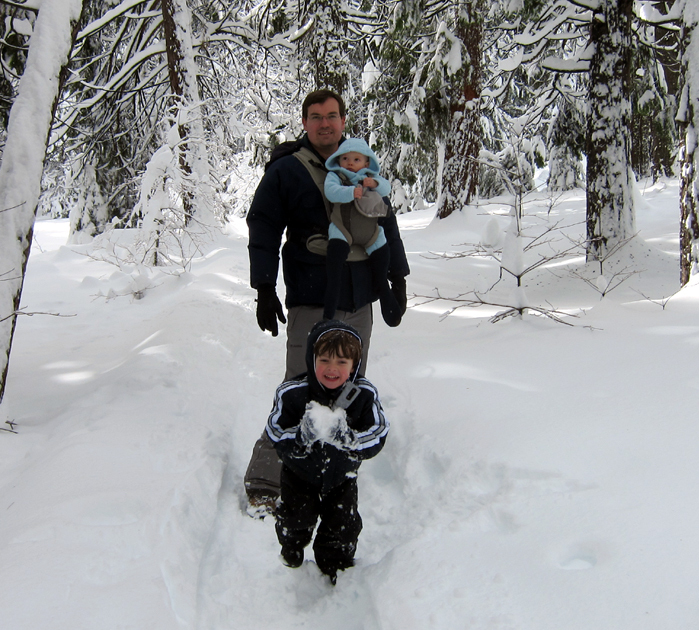 Last Saturday we went up to the snow; the four year-old had never played in snow before. I wanted to go last winter but things just kept coming up; in particular, people getting sick, but other things consumed our weekends as well, and we never seemed to make it, and then the snow was gone. Originally we had planned to go last weekend but my mother got sick, so there was a bit of a repeat there. But as it turns out, this last weekend was perfect. We went back to the folks' house Friday night. Left their place about ten and drove up to Calaveras Big Trees State Park. It was an inspired choice - the snow started appearing at around 3,000 feet, and when we reached the park (just above 4,000 feet) it was several feet of fresh powder all around. And since the park is on Hwy 4, with no big ski resorts higher up issuing their siren calls to the hordes, traffic was a non-issue. It had snowed all week and let up just in time for our arrival. I brought chains for the car, but in the event I didn't have to use them. The highway was clear to the park, just. They had plowed the parking lot; when we arrived at noon only a few other people were there, and we had a winter wonderland almost to ourselves. Three feet of virgin snow in every direction. Sledding! Snow angels! Romping through startlingly deep (thigh-high on me) snow! We probably never got more than 100 feet from the parking lot, but we didn't need to. Two hours later we stopped for hot chocolate (cooled down from piping-hot thermos temperatures by fresh snow) and headed out. It was perfect. The four year-old loved it, grandma loved it, I loved it, Mrs. Oso loved it - even the baby was good, although I think he was a bit nonplussed. No one got too cold, no one got too tired - the weather was great, grey and overcast so there was no glare at all. Didn't even need sunglasses. Yet the air was warm enough that one's lips didn't get chapped. We were all dressed just right, including those so-important snow pants. Pictures are up in the gallery. For those who have forgotten, the username is Mrs. Oso's first name, and the password is mine. Capitalization is important! You know "cheap, fast, or good"? An upgrade installation is initiated by specifying an installation directory that is at the same directory level as the installation directory that was specified for the previous installation. Just an example of why going with the cheapest of the cheap (offshore) tech writers probably isn't the best idea. Unless you're trying to drive more users to tech support. I was at the gym on the elliptical machine, which meant that I had to choose between 'The Price is Right', some Maury Povich-like show, or ESPN. Normally it would be ESPN hands-down, but in this case they were discussing in detail Mark McGuire's steroid use, about which I could not care any less. So it was 'The Price is Right'. Now, 'The Price is Right' is pretty far to the 'Wheel of Fortune' side of the game show spectrum, where 'Jeopardy' is for rocket scientists and nuclear parapsychologists, and 'Wheel of Fortune' is for people who get investment advice from their dog (who generally advises them to invest in commemorative plates and "U.S. Mint" gold-clad "1876" $10 coins, for only $19.95 each limit 6 per customer). Being closer to the 'Jeopardy' end of the scale, I found one thing about 'The Price is Right' particularly annoying. Points are determined by how many people (of a sample of 100) answered a question in the same way that you did. Note the complete lack of 'accuracy' in that statement. It doesn't matter how good your answer was, what matters is that you can think the most common thought. If the sample group all thought that the Wright brothers made the first nonstop trans-Atlantic flight, well then that's 100 points for that answer and a big goose egg for Alcock and Brown. What I want is a game show that also involves questions asked of 100 people, but where the contestant scores points for being correct, and the fewer people out of the 100 that also got the answer right, the better. Give the contestant three questions, say, of varying levels of difficulty, in a given category. They choose a level of difficulty, after which the question is revealed. If their subsequent answer is correct they get (100 less the number of questionees who answered the question correctly) points. If they answer incorrectly, they get horsewhipped by Stephen Hawking in an "Aliens"-esque exoskeleton. No, if they answer incorrectly, another contestant can steal the answer or some such thing. Easy: Cheyenne is the capital of which U.S. State? Medium: Which Canadian city of over 100,000 people is the furthest north? Hard: Lord Howe Island is administered by which country? There may have been a game show along these lines, given the quiz show craze of the 1950s, but if so I'm not familiar with it. Next contestant. "So I ordered this shipment of lead from China, and when it arrived I found that it was contaminated with toys and pet food!" Once again, particularly if you have children, avoid buying things made in China. This time it's not lead - it's cadmium! Even more toxic! ...On the CDC's priority list of 275 most hazardous substances in the environment, cadmium ranks No. 7. "We consistently seek to sell only those products that meet safety and regulatory standards," Wal-Mart said. "Currently there is no required cadmium standard for children's jewelry." An infuriating statement which is surprisingly common! Two charms on a "Best Friends" bracelet bought at Claire's, a jewelry chain with nearly 3,000 stores in North America and Europe, consisted of 89 and 91 percent cadmium. The charms also leached alarming amounts in the simulated stomach test. Informed of the results, Claire's issued a statement pointing out that children's jewelry is not required to pass a cadmium leaching test. Remember, if it's not illegal, it's okay! We've outsourced all moral responsibility to the government - and then fought to weaken or eliminate standards wherever possible! I'd grouse about China, but they couldn't do it without their equally amoral buddies over here. DIAF, Wal-Mart. Bigger than Cheeses is not a webcomic for everyone - in fact, it's aggressively not for everyone, and frequently quite tasteless - but I have to admit I am tickled by this one.